Eliot Bliss a great poet, a great writer, an incredible woman. I wish to mention here Patricia Allan-Burns, her faithful companion. 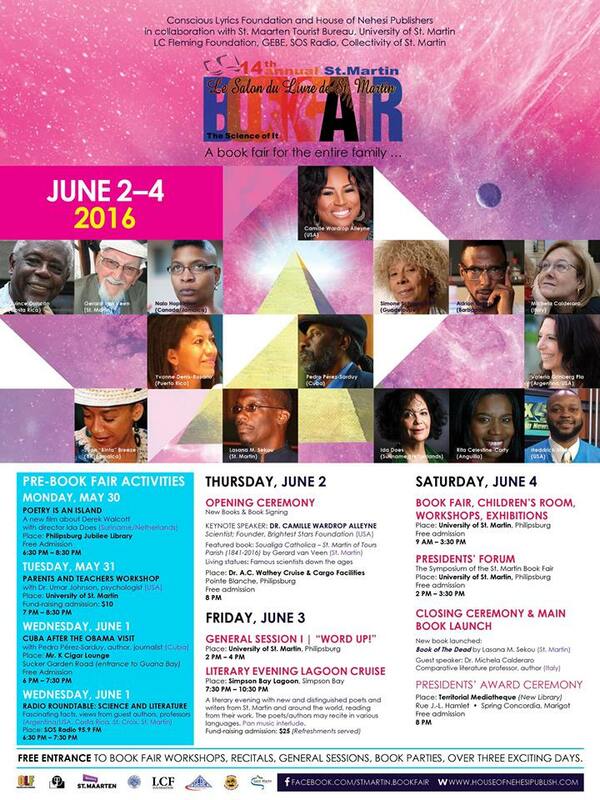 I also want to thank the Eliot Bliss Estate for the constant support. 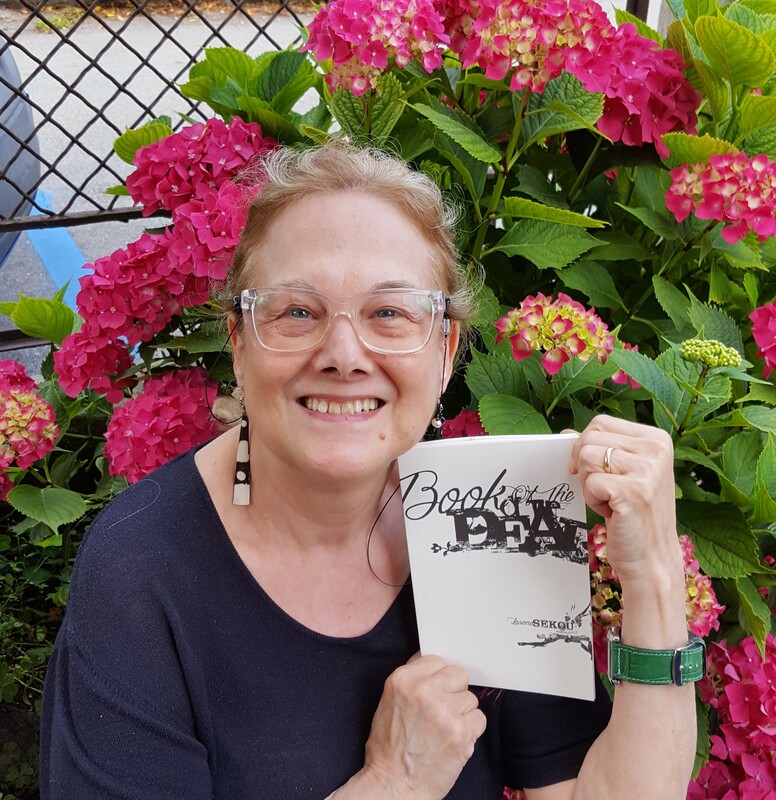 Shara McCallum, Madwoman, (2017) Peepal Tree Press (UK) and Alice James Books (USA). 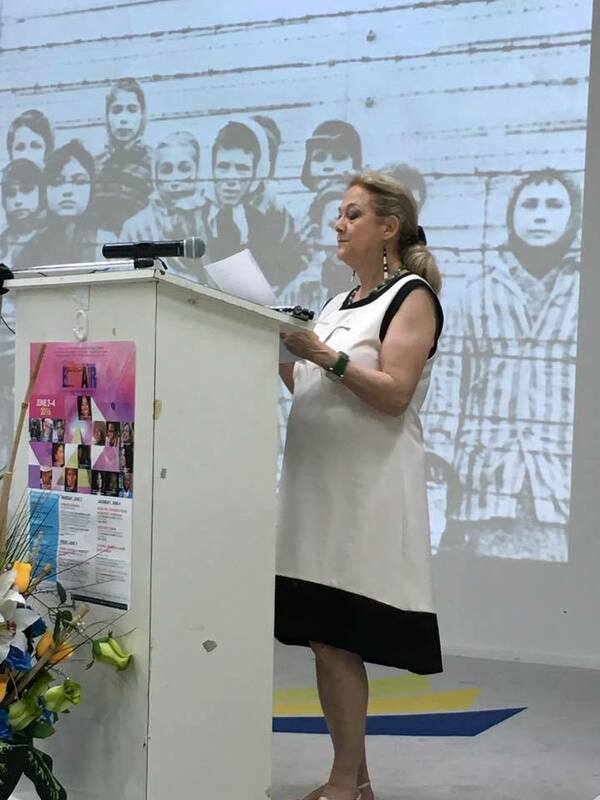 It has been a very exciting journey… working on Shara’s work has always been, for me, like embarking on a voyage across unexpected waters…. Glad that the idea of the complexity of defining “Time” and “Space” in the Caribbean is shared by other critics and writers! The madwoman is “everywhere, so nowhere; /in plain sight [she walks] through walls” (“Race”, p. 17). Her body is masked with “multiple skins” – a smooth skin, or scales, a flesh that is white or black. She looks like no one else, and she can belong to no person and no place. She is the “whore of Babylon,” and she is the kin sister of Lot’s wife [of Sodom and Gomorrah]. She walks alone, has no companions with whom to share her tragedy. She will always long for something that cannot be, seeking to become something that she cannot be, hoping for a life that she cannot even fathom, but knows exists. 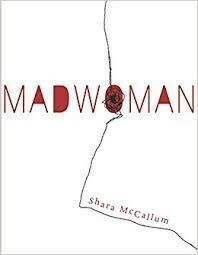 The figure of the madwoman has always been a conspicuous presence in Shara McCallum’s writings, ever since her first collection of poems. This figure is a ghost, sometimes visible, sometimes just a vaguely perceived presence. She is “the howling night,” a haunting nightmare. She can take on different forms: she is a mother, a daughter who can morph into a fish, a mermaid, a snake, a bird. She is a life bearer who suddenly turns into a bearer of destruction and a maker of havoc. She is a being that cannot belong and is therefore condemned to wander through land, sky, and sea in an endless quest. She is the daughter of Destiny, the progeny of the collective memory of Europe, Africa, and the New World. Here, as in McCallum’s previous works, poems are brimming with cross-cultural, historical, popular, and literary references. Poems communicate across the collection, reaching out to her earlier books. Moreover, as with her other collections, we are led into the maze of Madwoman by an epigraphy. This time the lines that precede the poems are by Lisel Mueller: “Memory is the only afterlife I understand…” Mueller’s words, her whole oeuvre actually, reflect Shara McCallum’s own interest in the mechanics of memory, in how memory works in order to create or re-create images of ourselves, how the life we present to the public would often clash with our own private, inner self. The fate of the madwoman is forever linked to the fate of the mermaid, who loses herself trying to understand who she really is. Madwomen, as far back as we can remember, have always been locked up in the attic. Often, madwomen were wives or daughters who had defied the patriarchal order, wives or daughters of different skin colors or, simply different from what society was expecting them to be. We find in McCallum’s works yet another defining trait of the madwoman: a geographical dichotomy between natural spaces—such as islands and water—where she can breathe and cultural spaces, either mental or physical, where she is kept confined. And this leads to another larger dichotomy, between past and present. Indeed, in Shara McCallum’s new collection, time and space become closely inter-connected because the memory of outer space, which is also the memory of a time lived in the past, clashes with the claustrophobic spaces of the present. Thus, time and space define who the madwoman really is. Mermaids, time and space, both present and past, both physical and mental, and geography and history all come together in one of the most lyrical and symbolic poems of the collection, rightly titled “Madwoman’s geography,” where we witness an astonishing and revelatory transformation. The transformation of the speaking ‘I’ in the poem follows the transformation of the mythological water goddess from the snake-woman, covered with scales, to the bird-woman, flying up in the sky, to a water being, a mermaid, a siren, who, also covered in scales, follows the wake left behind by ships in order to chart her course, in a timeless circular movement, an evolutionary process leading to eternity. Such an evolutionary process cannot but echo W. B. Yates’s “Sailing to Byzantium.” There too, we find a similar triad, “fish, flesh or fowl,” and there too the triad becomes dynamic if considered as a scansion of an evolutionary process—that is, if we move it on a temporal and spatial dimension. From the sea, as a fish, comes the man/flesh, who will soar, as a fowl—both intellectually and artistically. The form of symbolism reached by McCallum is similar to Yates’s. As in Yates, her conception of the universe is both mystical and visionary, based on images which become symbols, of beliefs and folklore which allow her to create her own order of things, her own cosmic system. And here too the speaking ‘I’ becomes the symbol of the Artist. Once again, almost without perceivable efforts, McCallum combines experiences and influences from the many cultures that make her one of the most challenging voices in contemporary literature. Using and reinventing language, McCallum unveils the self that, through appearing through metaphors and images, has been hidden from public view. Then she leads us towards unknown and scary territories, to the final realization that the madwoman is what we see when we wander “the hall of mirrors” and look deep enough into the broken mirror of life. (1) Sirens are said to have been snake-women, or to have been given wings by Demeter, who was hoping their songs would help find her daughter Persephone. They were the bird-women who would accompany the dead to the Underworld, and who later lost their wings when challenging the Muses, Zeus’s daughters, for the best song. (2) Sabine Jell-Bahlsen, The Water Goddess in Igbo Cosmology, Trenton and Asmara: Africa World Press, 2008, p. 196. From one lagoon to another…. I wish to thank Geoffrey Philp for his review of Eliot Bliss’s collection of never published before poems. “Neglected authors fascinate me. While the particulars for their disregard may vary over time and from culture to culture, one thing remains constant: their perseverance despite official recognition. Such is the case of Eliot Bliss, a “white, Creole, and lesbian” Jamaican novelist and poet whose collected poems have been resurrected by Michela A. Calderaro in Spring Evenings in Sterling Street. 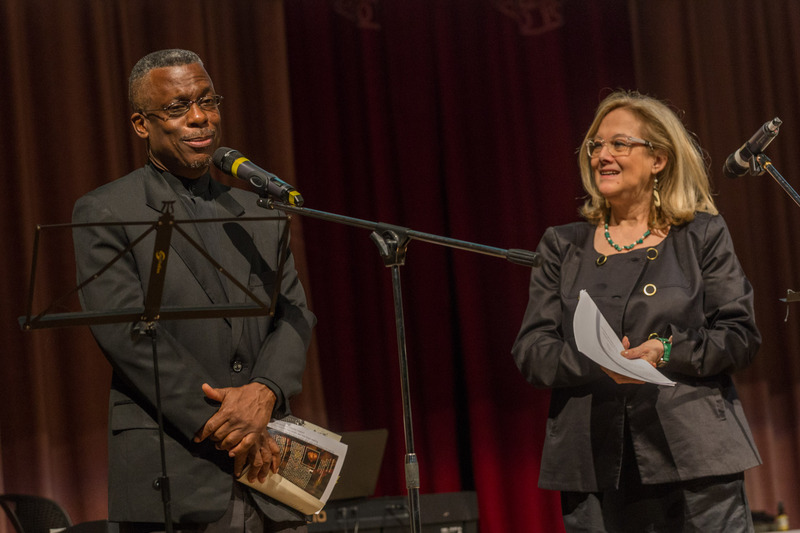 In the introduction to the collection, Calderaro pays tribute to Patricia Allan-Burns, Bliss’s “faithful companion for about 60 years,” and places Bliss within the context of Caribbean herstory: “The story of Eliot Bliss is the story of a mermaid, as Creole women from the Caribbean often envision themselves. Indeed they are mermaids – half something, half something else.” Calderaro also provides a brief biography, which traces Bliss’s troubled life from her birth in Jamaica to England where she died. 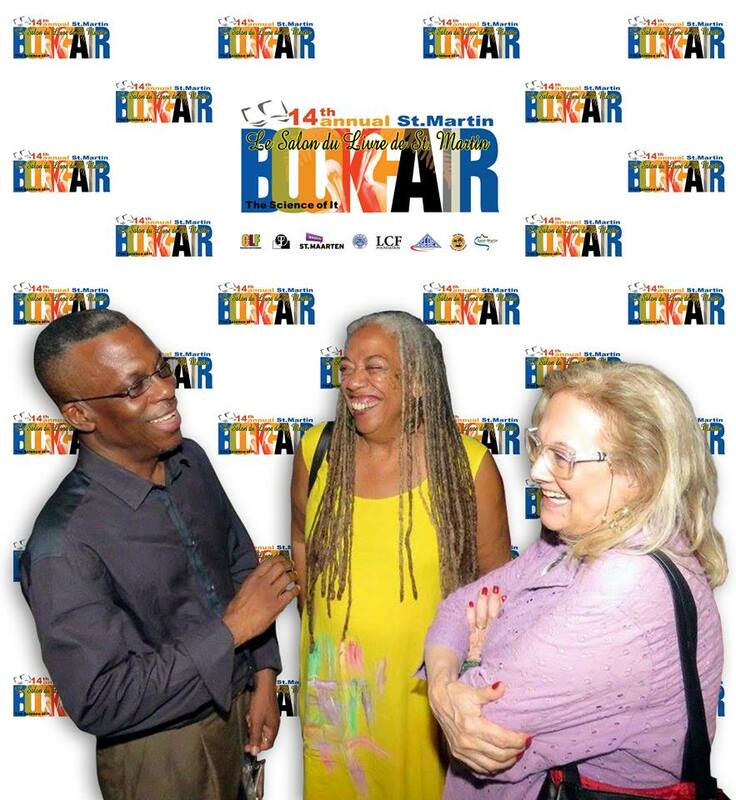 We’ll try to follow Eileen Bliss in her journey to become herself, to witness her struggle to cast off the white British colonizer’s daughter persona and take on that of the Creole expatriate, not feeling comfortable in either. We’ll see her transformation from the perfectly educated daughter of a British army officer to the acclaimed new voice of 1930s London applauded by the elite literary circles and the scandal of lesser-known lesbian clubs in that city. And, finally, witness how in her later years she found herself exiled and forgotten. The poems in this collection were found in 2004 in the little apartment where Eliot Bliss spent the last years of her life. There were two almost ready collections, Selection of Poems: 1922-1931 and The Wild Heart: Poems 1922-1929, and then a considerable number of loose poems – originals and edited versions – in various places around the house, piled on dusty shelves, inside drawers, inside old cocktail-bags, some folded in books, others in envelopes. These uncollected poems are grouped under “Miscellaneous Poems” in this book. 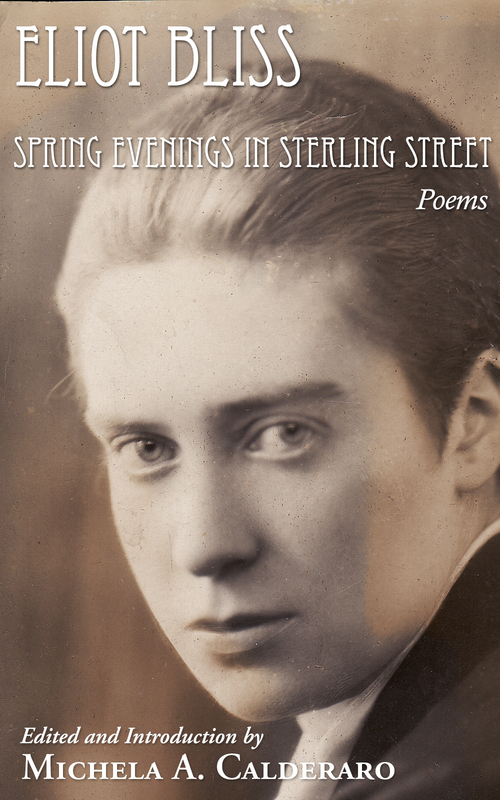 Many of the poems in Spring Evenings in Sterling Street display Bliss’s “rich and sophisticated” language. And while poems such as “The Green Tree,” “If I Write With My Blood,” and “The Chameleon” from Selection of Poems: 1922-1931 and “Rain During the Night” and “The Departing Amorists” from The Wild Heart: Poems 1922-1929 demonstrate Bliss’s commitment to her craft and mastery of a carefully wrought line, it is the poems in the “Miscellaneous Poems”–the poems that she chose not to reveal to the world–that interest me. In “Transubstantiation” and “Introibo ad Altare Dei,” Calderaro points out that despite their seemingly pious titles, the poems “subvert religious evocations and transform them into sexual allusions.” I will not attempt to paraphrase Calderaro’s insightful exegesis of these poems. Instead, I focus on “The Confession,” where Bliss pursues a similar strategy. In “The Confession,” originally titled “The Thief,” the reader is offered a glimpse of the “inventiveness with words” that Bliss employed in “Transubstantiation” and “Introibo ad Altare Dei.” However, in “The Confession,” the sonnet form restrains her choice of rhyme, yet frees her to explore the theme of unrequited love. And do your gracious absolution ask? If I should set myself to this silly task? To hear your voice I’d sin a thousand times! I only dreamt it – do not tell me so! According to the American poet Robert Frost, “Poetry provides the one permissible way of saying one thing and meaning another.” The tension of paradoxical utterance is the source of poetic complexity and rewards with repeated readings. Eliot Bliss’s work embodies this principle and Calderaro is to be congratulated for recovering these poems from obscurity, and for bringing them back to our attention”. 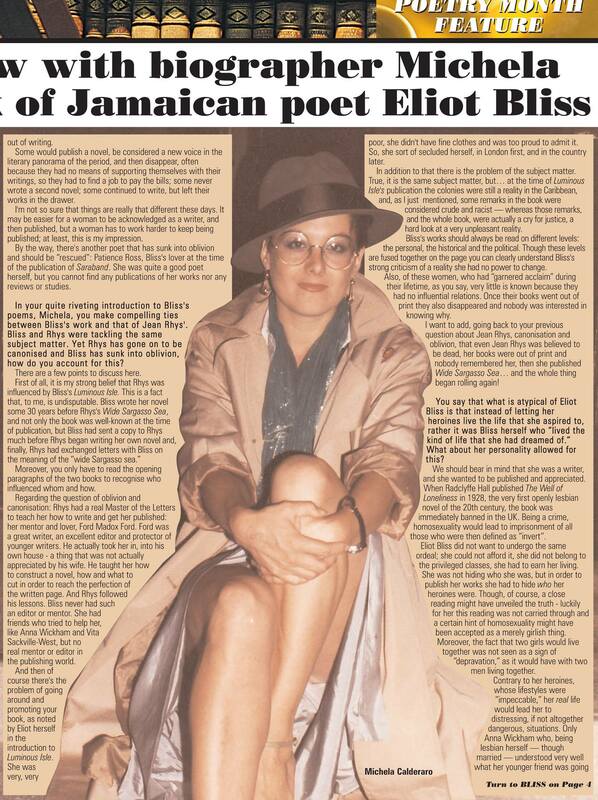 ‘White Caribbean’: An interview with biographer Michela Calderaro on the life and work of Jamaican poet Eliot Bliss, “Bookends”, the Sunday Literary Supplement, The Jamaica Observer (19 April 2015). 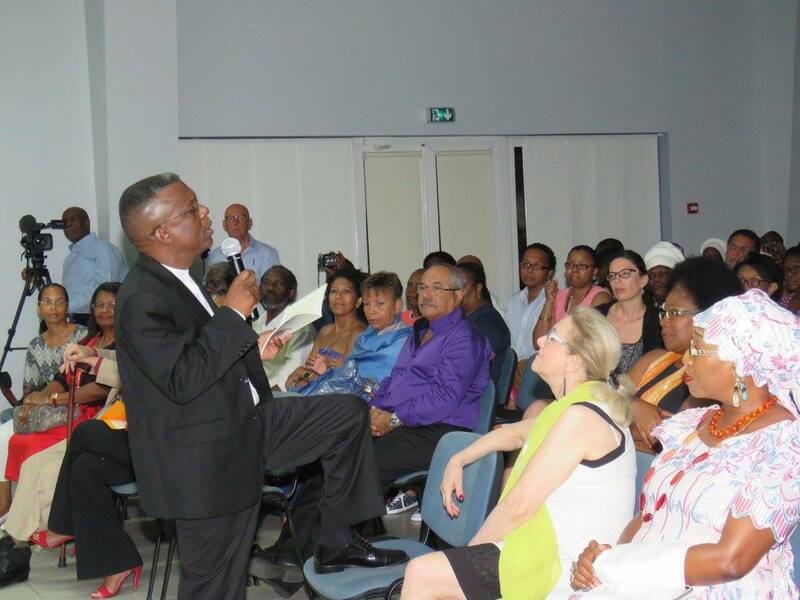 New Book Review – “Main Book Launch and Closing Ceremony” of the 14th annual St. Martin Book Fair, June 2 – 4, 2016. 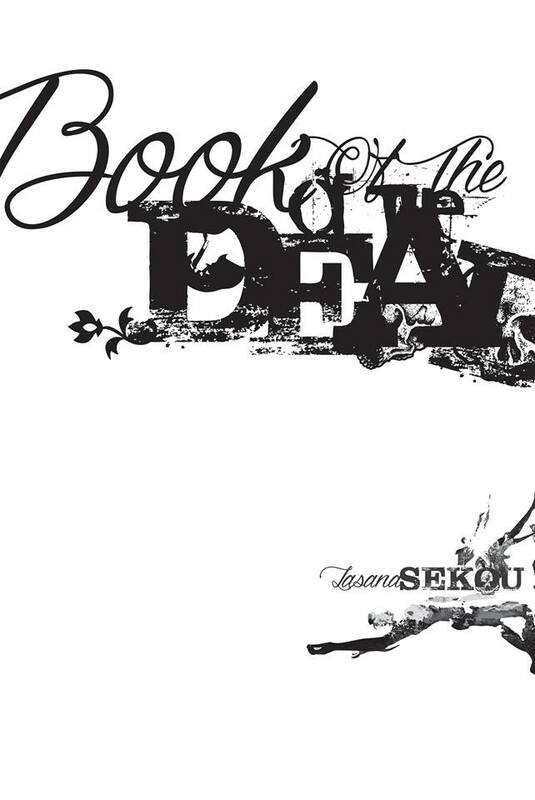 Book of the Dead by Lasana M. Sekou. 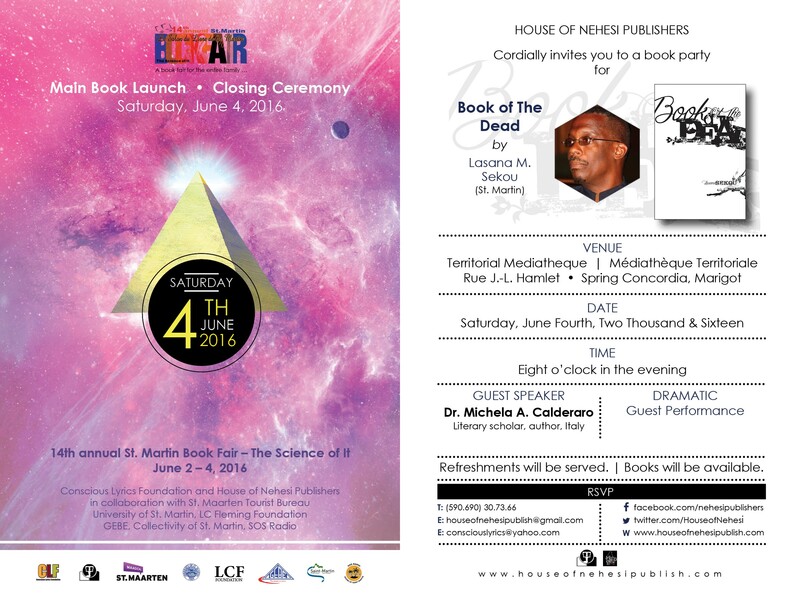 It was a real honor to be given the possibility of presenting Lasana Sekou’s amazing new collection of poems, Book of the Dead, at the main book lauch/closing ceremony of the 14th St. Martin Book Fair. 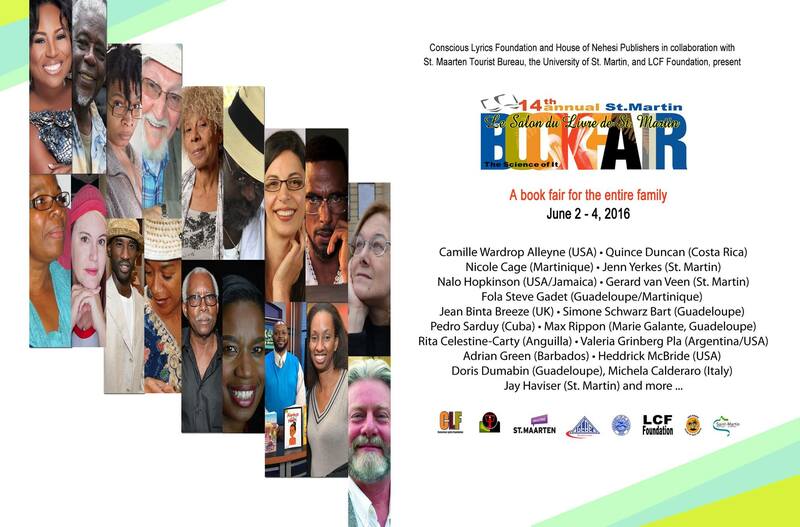 I admire Lasana Sekou’s work, and strongly believe it is leading the way to the creation of a Caribbean aesthetics that would be a reference point for young and not so young artists all around the world. I wish to thank Geoffrey Philp for his review! Thank you Geoffrey Philp for reviewing my book, Eliot Bliss, Spring Evenings in Sterling Street, A Collection of Poems. Neglected authors fascinate me. While the particulars for their disregard may vary over time and from culture to culture, one thing remains constant: their perseverance despite official recognition. 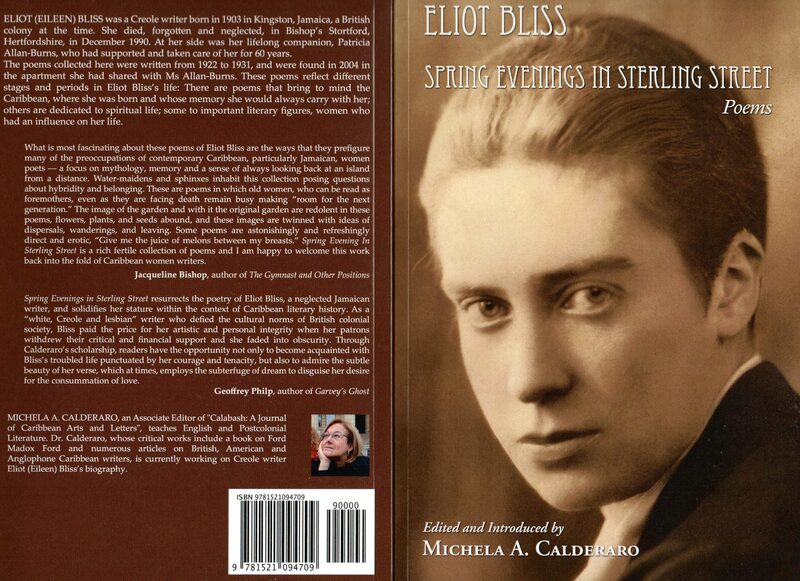 Such is the case of Eliot Bliss, a “white, Creole, and lesbian” Jamaican novelist and poet whose collected poems have been resurrected by Michela A. Calderaro in Spring Evenings in Sterling Street. According to the American poet Robert Frost, “Poetry provides the one permissible way of saying one thing and meaning another.” The tension of paradoxical utterance is the source of poetic complexity and rewards with repeated readings. Eliot Bliss’s work embodies this principle and Calderaro is to be congratulated for recovering these poems from obscurity, and for bringing them back to our attention.